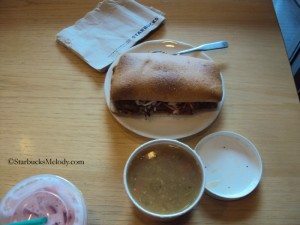 Today I had the chance to see the “warm lunch” test going on at a downtown Seattle Starbucks, and I tried some nice hot soup and a sandwich for lunch! 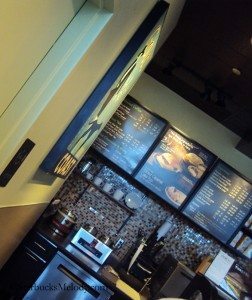 I dropped by this Starbucks, having heard rumors that they offered soups and sandwiches, and so I wanted to check it out. 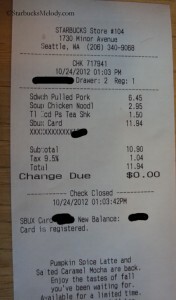 I ordered the BBQ pulled pork sandwich and had a bowl of chicken noodle soup with it. It was a little bit too much food, but I really wanted to try both a soup and a sandwich. 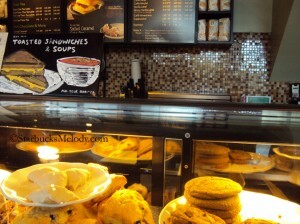 By the way, this is definitely not the first time that I have mentioned soup at Starbucks on this blog. There was a time briefly when soup was tested at the “experimental” store once called “15th Avenue Coffee and Tea,” though currently that location is a Starbucks, with standard Starbucks food. (That Starbucks kept its manual espresso machine, and so it is one of only a handful of North American Starbucks stores with a manual espresso machine.) Furthermore, I mentioned that soup was offered at the Children’s Hospital Starbucks, and as far as I know, that store still regularly has soup offerings on their menu. 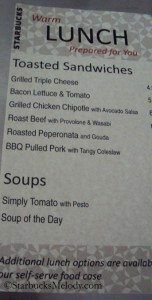 I think that Starbucks has experimented many times with offering soup on their menus – those are two more recent examples of that. As I had lunch, the store manager came and sat with me for a minutes, chatting about Starbucks. She recognized me. I recall that she dropped by the Starbucks at Fourth and Union to talk to that store manager, Rachel, and I recall being introduced to Pauline (store manager of this store with the food test) at that time. It was good to see her again! She’s passionate about Starbucks, and I learned that she worked her way up from barista to store manager in just four years! I asked a few questions about the food test. As to be expected, her customers love it. She mentioned that the demand for the soup and sandwiches usually lasts from about 11:00 a.m. to about 4:00 p.m. every day, though the store has everything ready to go by about 10:00 a.m., to be ready for their lunch rush. My sandwich was delicious. I love a good pulled pork sandwich. Pauline recommended the chicken chipotle sandwich, as it is a very popular item. However, I shy away from spicy foods and opted for the pulled pork. Hope you enjoyed reading about this! I thoroughly enjoying seeing the many things that Starbucks tests, and I have a whole category with many more test articles here. Over the years, I’ve come to realize that Starbucks tests many more things than they ever launch nationally, so just because something is in testing doesn’t mean that it will ever come to your local store. However, I really do hope to see this spread to more stores. There have been many test items that I’ve crossed my fingers and toes for, hoping to see them launch nationally. I am still disappointed that the Starbucks Peach Iced Green Tea Lemonade never made it to a national launch. And I’m still very curious about the Apple Crumble Frappuccino too, which recently launched in Poland, and previously was tested in North Carolina. What do you think? What soups and sandwiches do you want to see at Starbucks? Which downtown Seattle store is this in? I want to go and try it out! Thanks! @Laura – Hope you do try it and let me know what you think. Hint. 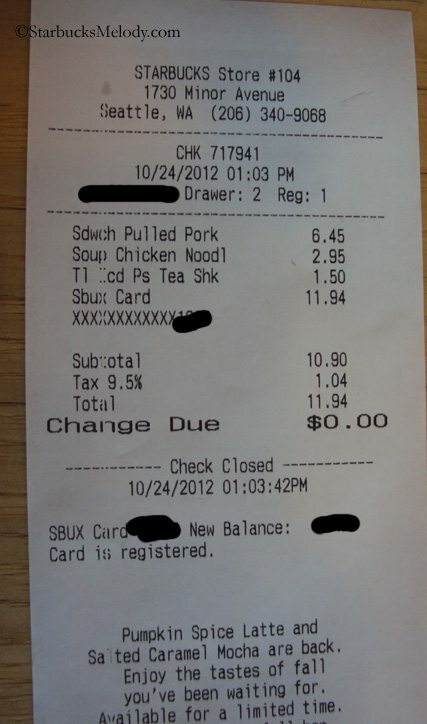 Look at the receipt I posted. Since I usually spend my lunch hour at Starbucks, soup and/or a sandwich would be great instead of the usual coffee and rice crispy treat. (Yeah, I know, I’m a bad eater). I’m disappointed I was in meetings most of today, otherwise I would’ve stopped over there and said hello! I am liking that store more the longer my office has been nearby. Melody are these new food items free if you have a reward? 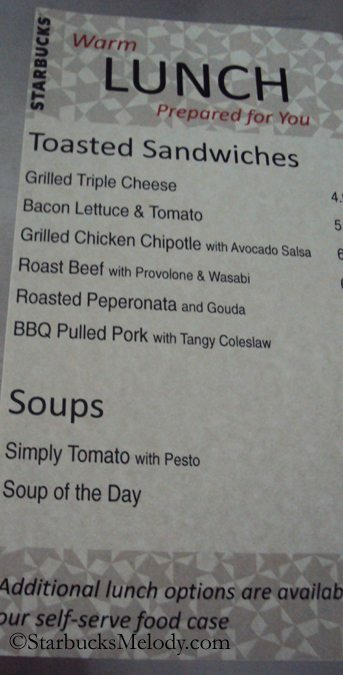 Glad to see a grilled cheese sandwich but which they would offer more vegetarian choices. Do you happen to know if the soups have chicken stock or vegetable stock? I would not mind soups on the menu if I could eat them. Any nutritional information on those hot food items? I went here for lunch today and tried the Grilled Chipotle Chicken sandwich with avacado salsa (I wanted the Chicken Noodle Soup, but the feature was White Bean. Oh well, another time). It turned out to be pretty much just grilled chicken on a panini/bun that got toasted, and then I’m pretty sure that the barista had to open the sandwich and spread on the avacado salsa. So although it wasn’t very crowded, it took longer to get than just a regular heated panini. It wasn’t bad, but I will probably stick with their regular Chicken Santa Fe. Or come back and try some of the other new offerings. I also noticed two new things in the RTD case. They had a Greek Farro salad with Greek dressing, and a roasted veggie and brown rice salad with lemon tahini dressing. And because I like free food, I asked to use a Reward on my sandwich. It worked no problem! As to the question about nutritional value, the new sandwiches are kept in back rather than in the RTD case. So you don’t have the option of reading the packaging. Maybe if you ask? @Laura – Good information. I may have to make a second trip back to this store to check the RTD case. The roasted veggie and brown rice salad sounds fantastic. By the way, I’m sorry but I didn’t ask about the nutritional information at all. If I take a second trip to the store, I will ask. I just saw a man with a nice warm bowl of something. Thought it was soup, so I typed it into Google and alas it seemed too good to be true. Turns out it was oatmeal. I wonder if they’ll ever include soup full-time on their menu.